A large new office building being built across from Brickell City Centre still hasn’t been revealed to the public in renderings yet, but the developer signed a deal with the county this week to bring utilities to the new project. A deal has also just been inked to lease 10 floors of space, according to The Real Deal. 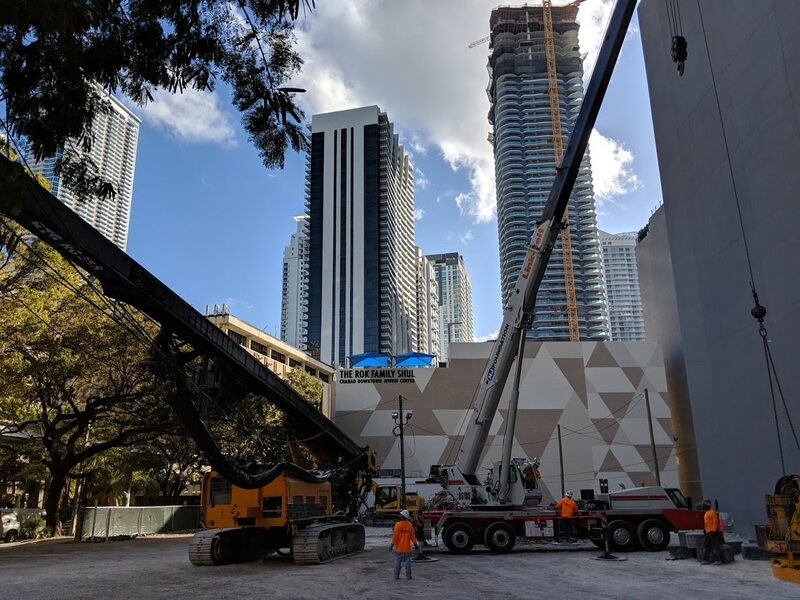 WeWork, which also operates inside Brickell City Centre itself, is taking 146,000 square feet of space in the new 888 Brickell Plaza (also known 830 Brickell) office tower, the website reported. It could become the largest WeWork space in Florida. 888 Brickell Plaza hasn’t been submitted for review by Miami’s Urban Development Review Board, and city planners don’t seem to be familiar with it. The architect is unknown, and developer OKO Group has declined to comment. Construction appears to be underway. Completion is set for early 2021, TRD wrote. A pending construction permit shows that the tower will rise 56 stories and include 555,094 square feet of office space, but no review of construction plans has taken place. A separate permit for $6 million worth of site improvements is approved and active. A registration on the U.S. Green Building Council website from May 2018 lists the project at 939,777 square feet. An application for a building height of up to 834 feet above ground was submitted in summer 2018 to the FAA. Don’t care if its a giant glass rectangle, i’m just glad a building that is entirely office is being built in the urban core. I think OKO will come up with a bit more than a rectangle seeing their impressive other projects in Miami in the works. Maybe wework’s new chief architect, Bjarke Ingels will even be designing this! Amazing that we are getting an entirely office tower, a sign of a strong city. Agree with you.. OKO isn’t building low-budget towers. You mean a giant glass rectangle like Missoni Baia? Less of that crap and more Una. Yay! More office towers please! Thank you! All of you crying for office towers. Where the company gonna be if we dont got towers? construction underway and completion in 2021 of a 834 foot office building but no design or renders ? Mysterious indeed. Isn’t this the chicken kitchen site with the foundation equipment on site already? OKO’s portfolio shows some nice and decent designs. I think we can expect something nice and decent considering the area and their design track. What kind of city allows construction to start without even knowing what’s being built? Only The Next Miami and Real Deal find this “mysterious”. 8 is the luckiest number in China. who cares, this isn’t china. Ooo I hope it’s a luxury condo building with balconies and a parking pedestal. Brickell really needs a few more of those. MAGA (TRUMP) LA PUTA DE PUTIN!